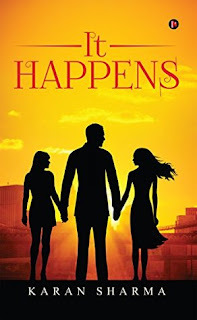 We introduced book : It Happens by Karan Sharma on the blog. Here is a question I had and the answer from the Author. Q: The Blurb talks about one woman protagonist but the cover shows two. Is it a trick or story plot? A: The cover with two women was to build curiosity especially with the blurb not mentioning anything about the other woman. It also signified the confusion in Gautam’s mind about women of two different generations. When one falls for such an age gap relationship it is very natural for the person to have a conflict about the practicality of this relationship especially when one compares to a relationship with a person of similar age. Hence the other woman is added in the plot to address this confusion. I deliberately though did not wish to mention the other woman as part of the blurb and keep it as a surprise element. Infact Payal I introduced in the first chapter but refrained from giving her too much prominence so that the reader is kept guessing about who the other woman is and what will be her role. Sometimes reading blurbs I find they give too much away regarding the storyline which reduces the surprises which I as a reader look forward to. So it was a trick for a person who had not read the book and a story plot for one who has. The cover and blurb have to build enough curiosity for a person to pick up and read the book which I feel it has done.